So Kingdom Hearts 3 is finally coming out. For many fans we’ve been waiting for this moment for well over a decade. The original Kingdom Hearts 1 and 2 came out on the PS2 in the early 2000s. Some of us were in elementary school, some of us high school, and *cringe* some of us weren’t even born yet. With the ‘third’ game arriving on the PS4 and Xbone many of you will be finally playing a Kingdom Hearts game after many years. There hasn’t been a truly new game in several years now, and others simply stuck to the PS2 games to understand what is happening. For others, this may be your first foray into the Kingdom Hearts franchise since you never owned a Sony system before. When you pick Kingdom Hearts 3 up you are going to gear up for adventure where Disney characters and Square Enix characters fight along side each other for the ultimate battle between light and darkness...and you will probably have no idea what the hell is going on. Since Kingdom Hearts 2 there have actually been many, many Kingdom Hearts games. Some are remakes, some are non essential, and some are vital to understanding what is actually happening in the story. This guide will help you understand what games you should play in what order, and who certain characters are as well as some common terms, reoccurring themes and villains so that when Kingdom Hearts 3 is played, you won’t be completely and totally lost. Part One is pretty spoiler free, but parts two and especially three don’t hold anything back. The original game that introduces us to the world of Kingdom Hearts, the primary characters and that beloved impractical weapon, the Keyblade. If you haven’t played this game, there is really no point in playing 3 because you won’t know who anybody is or why any of this stuff is important. This game lays all the groundwork for both worldbuilding and character development. If you haven’t played the PS2 version, get the version from 1.5+2.5 for the PS4. Not only is that version HD, it includes stuff from the previously Japan-only version, Final Mix, which has even more content that expands the lore. Effectively Kingdom Hearts 0, a prequel game that takes place nine years before Kingdom Hearts. Introduces us to Ven, Terra and Aqua, three essential characters who will keep popping up, as well as more info about Xenahort, King Mickey and Keyblades. I recommend you play this after the first two as to not spoil certain plot points. Available on the PSP, but probably smarter to stick to the collected 1.5+2.5 as well. More info about the members of Organization XIII, introduces the important character Xion, and explains one of the secret scenes at the end of Kingdom Hearts and why Sora can fight with twin Keyblades in Kingdom Hearts II. Also goes into detail about the friendship between Axel and Roxas. Fun info if you’re interested in that character background stuff, but not vital to understanding the larger story behind Kingdom Hearts itself. The DS version is a playable game, the one that comes with the complete collection is a movie that’s 3 hours long. Really a matter of preference. Taking place also after Kingdom Hearts II when King Mickey, Jiminy, Donald and Goofy work to reconstruct Jiminy’s Journal. Explains what happened to Maleficent during all this time, but if you already skipped Chain and Days, you aren’t missing much. Movie over the game, the DS game is kind of a slog. Kingdom Hearts: The Heart of all Worlds that exists between the worlds of Light and Darkness and the largest source of power in the universe. Sealed behind a door that can only be opened with the X Blade. Keyblades: False facsimiles of the true X Blade. Originally used as weapons to protect the world from darkness, became weapons of war that unleashed the darkness and almost destroyed the world; the descendants then began using them to protect the fractured worlds. Can open and close almost any lock including the hearts of individual worlds, as well as connect worlds to one and other. Sora’s blade, the Kingdom Key is one of the most important Keyblades and is the twin to King Mickey’s. Keyblade Masters: Essentially Kingdom Heart’s version of Jedis. They pick apprentices who will inherit their blades and train them. They either then must engage in combat or go on a quest to gain their Mark of Mastery and be true masters. Non-masters can use Keyblades, but Keyblade Masters can unlock their weapons’ true potential. After the events of Birth by Sleep King Mickey is the last Keyblade Master and seeks to find another Keyblade user to help him seal the Door to Darkness in the original Kingdom Hearts game. This wielder was originally supposed to be Riku, but because of the darkness in his heart, the Kingdom Key ends up going to Sora instead. The World of Darkness: One half of the world. Can be accessed with the Door to Darkness that can be unlocked with the Seven Princesses of Heart. Ansem mistakenly believed that beyond this door is where Kingdom Hearts is. When the door is open darkness flows in and consumes everything it touches, and can be only sealed with the Kingdom Key locking it from both sides. Princesses of Heart: Seven girls with hearts containing no darkness. When gathered together then can open the Door to Darkness, which Ansem thought lead to Kingdom Hearts. Heartless: Entities that exist in the world of darkness that seek to consume the hearts of others because of the darkness that exists in them. There are ‘pure’ Heartless and so-called ‘emblem’ Heartless. The pure kind are the ones that exist in the world of darkness naturally. Emblem Heartless were artificially created by Xenahort using the stolen hearts of people. When a person or animal has their heart stolen, they themselves become Emblem Heartless, but those with a tremendous amount of darkness in their hearts will become Heartless on their own. The World that Never Was: The shadowy world between the worlds of darkness and light. It is only partially formed and doesn’t truly exist, and everything that lives there is destined to fade away. Where Organization XIII had their headquarters and tried to make their own artificial version of Kingdom Hearts. Nobodies: The souls left behind when someone becomes a Heartless. Most are little more than empty shells that fade away, but those with powerful hearts maintain a human form. They feel no emotion but maintain their original memories, meaning they act on programming rather than personality or feelings. The World of Light: The world where Sora and the others make their home. Once a united world that fell to chaos and darkness until the light that exists in children saved it. Now exists as fractured worlds separated from each other by walls of light. Keyblade users can connect these worlds together with paths of light to travel to them. Unversed: Monster born from peoples’ emotions. While most appear spontaneously, a powerful person can summon and command them intentionally. Dream Eaters: When the Door to Darkness was sealed and the worlds were returned to normal, many worlds remained asleep in a perpetual state of dreams of their past. Dream Eaters are entities that exist there. Some of benign and helpful while others are malevolent and actively try to destroy everything and everyone around them. Traverse Town: When worlds are consumed by darkness, bits of the worlds and their refugees come together to form their own mini world. When things go back to normal, the world goes back to sleep until it’s needed again. Twilight Town: A mysterious town that exists between the worlds of light and dark. Unlike the World that Never Was, this is a real, substantial place. Many of the Nobodies manifest here after coming into being. Castle Oblivion: Mysterious world that exists between the worlds of darkness and light. Sora came here in hopes of finding Riku and ended up being manipulated by Organization XIII, who came to investigate the castle themselves. Was actually originally the world where Ven, Aqua and Terra were trained by their master Eraqus. The Council of Villains: Led by Maleficent, this council once included Hades, Captain Hook, Oogie Boogie, Ursula and Jafar. Their intention was to take over the world using the Darkness and the Heartless. In truth, they were being manipulated by Xehanort’s Heartless for his own ends. The council was broken up, but Maleficent is determined to see her goal through and get revenge. Organization XIII: Thirteen powerful Nobodies who wish to become real and gain hearts. Manipulated by their leader Xemnas, they think they are creating their own version of Kingdom Hearts to meet that end. In reality, they were being used so Xemnas could gain its power for himself. Ansem’s Apprentices: Five men who worked for Ansem the Wise in the Radiant Garden. Researchers, they worked with the king until a sixth new apprentice appeared and convinced them to work with more dubious research and usurp their king. The Neophytes: Term for Organization members VII-XIII, unlike the first six who were the Nobodies of Ansem’s apprentices, these Nobodies were not directly related to Ansem or Xenahort. Aside from Saix, Axel and Roxas, their original histories and motivations are unknown. 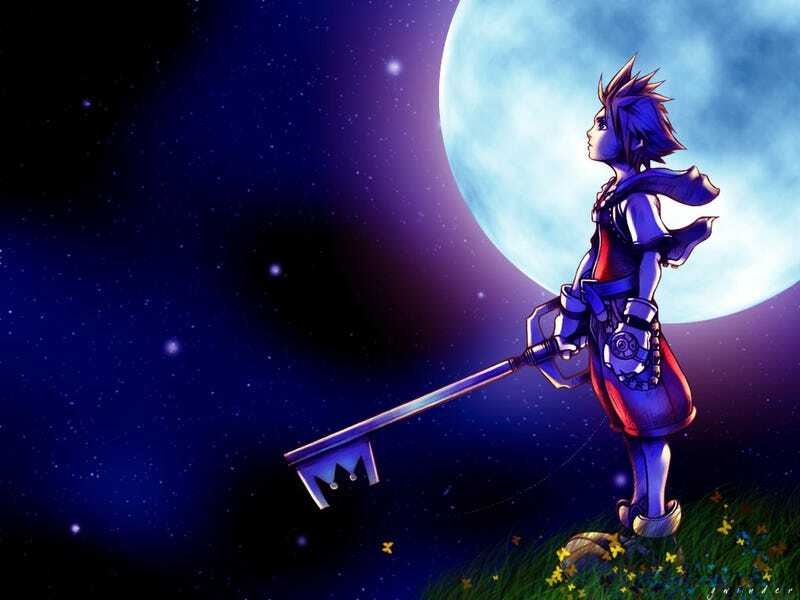 Sora: the main character and hero of the story. A native of Destiny Islands and best friends with Riku. As a child he took in the heart of the Keyblade wielder Ven and gained an affinity to be a Keyblade wielder himself. When the Destiny Islands were destroyed by darkness and separated by his friends, he went on a journey with Donald and Goofy to save the worlds. He was the first new Keyblade wielder after nine years, with his blade the Kingdom Key. Has a crush on his friend Kairi. Roxas: Sora’s Nobody. Special for his ability to use a Keyblade and lack of memory. He was a member of Organization XIII until his memories started coming back. When no one would tell him who he really was, he rebelled and left the Organization. He was captured by Ansem and put in an artificial world until he was merged back with Sora. Though actually a part of Sora, he maintains a separate consciousness and shares an appearance with Ven. Riku: Sora’s best friend and fellow Destiny Island native. Adventurous and ambitious, he dreamed of leaving the island and seeing the world. Was supposed to be the next Keyblade wielder after being chosen by Terra, but his heart became consumed with darkness and possessed by Xehanort’s Heartless. Manipulated by Maleficent, he blamed Sora for choosing to help the world instead of saving Kairi and worked for the Council of Villains. Since then has become a Keyblade user in his own right with his blade Wayfarer and has worked to atone for the darkness that almost consumed him. He even sacrificed his own appearance to try to help Sora regain his memories by capturing Roxas. Also implied that he had a crush on Kairi. First new Keyblade Master since King Mickey, gained after he saved Sora when he became lost in his own dreams. Kairi: Originally from Radiant Garden, she came to the Destiny Islands as a child. Friends with Riku and Sora, the three spent their time playing together until they got older. Has apparently developed feelings for Sora, because when the Destiny Islands became consumed by darkness, instead of becoming a Heartless, her heart joined with Sora’s. A Princess of Heart and tapped to be a Keyblade Wielder by Aqua, though she hadn’t gotten as much training or experience as Sora or Riku. Namine: Kairi’s Nobody. Unusual because she is the only Nobody to not have a corresponding Heartless. As such, she has unusual power, including the ability to manipulate the memories of Sora and everyone attached to him. Originally manifested in Castle Oblivion and used by Organization XIII, she was eventually taken by Ansem and Riku...and used by them instead. Eventually reunited with Kairi, she can appear in either Sora or Kairi’s mind as a separate consciousness. Like Roxas, she looks quite different than her Somebody, but the reason for that has not been revealed at this time. Xehanort: the Big Bad of the Kingdom Hearts franchise. Like Darth Vader, Voldemort and Lex Luthor all rolled into one. Originally a Keyblade Master, Xehanort became consumed by darkness and has spent his existence trying to get the power of Kingdom Hearts for himself. Preferring to manipulate and deceive his minions rather than enact his plans on his own, he has been defeated multiple times, but continues to manifest himself over and over again by using the darkness and possessing people. His alternate forms include Ansem’s Heartless and Xemnas. Twice he had tried to recreate the X Blade and then make his own Kingdom Hearts, his latest plan is to find the real X Blade to finally access the real Kingdom Hearts. Axel/Lea: Originally a native of Radiant Garden with his best friend Isa, for unknown reasons lost his heart and became a member of Organization XIII as a Nobody named Axel. Perfectly content to go with the Organization’s plan until assigned to train Roxas, he became best friends in spite of not being able to feel. When Roxas left the Organization and became reunited with Sora, Axel betrayed everyone and everything trying to get his best friend back. Eventually he sacrificed himself to protect Sora and became reunited his his true form Lea. With both his own memories of Ven and those of Axel’s, Lea came to Sora and his friends remembering his promise to always be his partner. Originally fought with giant chakrams, he gained new powers in Dream Drop Distance. Saix/Isa: Once Lea’s best friend, he became Xemnas second in command in spite of being a Neophyte member of the Organization. He wants his own heart and resents that Axel chose Roxas over him. His reasons for his devotion to Xemnas/Xehanort are unclear. Aqua, Ven and Terra: Three Keyblade wielders training under their Master Eraqus. When Aqua got her Mark of Mastery over Terra, it started a chain reaction that lead to almost the total destruction of Keyblade wielders. King Mickey: King of Disney Castle and the last Keyblade Master. Trained under the sorcerer Yen Sid, and friends with Ansem the Wise. When the world threatened to fall to darkness he went on a journey to stop it, while sending his retainers and best friends Goofy and Donald to look for the Keyblade user. Aware of Riku’s doubts after succumbing to the darkness in his heart, Mickey attempted to train him until Riku sacrificed his appearance. Sort of like Kingdom Heart’s version of Yoda. Goofy and Donald: King Mickey’s best friends and loyal retainers. They assisted Sora on many of his journeys. Yen Sid: World’s most powerful sorcerer. Knows a lot about Kingdom Hearts and the history of the Keyblade Masters. Originally trained Mickey to be a fellow sorcerer, but later down the line started training him to be a Keyblade wielder. The Master of Masters, the the Union Leaders: Back in the time of fairytales when the world was whole, an enigmatic man who trained six apprentices to take over for him in the event he should disappear. Five of his apprentices became the leaders of Keyblade Unions, in the futile attempt to stop the world from being destroyed after a vision from their Master. The sixth apprentice, Luxu was sent on a journey to gain as much information about the future as possible. Their fates as well as the events leading up to the catastrophic Keyblade War are at this point unknown. Sora and his friends are in a continuous battle against Xenahort, a good Keyblade Master gone bad, who keeps popping up in different forms with different schemes to gain the ultimate power of the universe, with various Disney Villians either helping or competing against him, all while fighting with impractical weapons all based off of the original key that unlocked the power. In Kingdom Hearts 3, we’ll learn just how he’ll finally be stopped.